Call out for your solidarity and your support! Still cooking, still fighting. After the eviction of our Social Center in the squatted and repaired factory and the expulsion of the beach across the road, the NBK found a new place. The NBSC at the new beach is a place where refugees, supporters and locals meet as friends. We work together, eat together and live together. There is shadow places, water, tea, urgently neede clothing and- what might be most important- a space for talks and solidarity outside of the overcrowded and for humans unworthy camps. Every day we keep on working towards strengthening our structures. Despite all the difficulties of the last weeks, we cook and distribute 650 meals every day. Of course vegan and tasty! With this we especially support people that don‘t want to or can‘t accept the catastrophic conditions in the camps and their self-organizations. To keep up our work and the autonomous structures on the island, we keep on needing your support and your solidarity. We welcome donations of money as well as people that feel like supporting us on the ground. Our project is needed in the situation we are in, but cannot offer a solution. Yesterday on August 20th around 200 people, mainly from Moria camp, gathered in the center of Mytilini to demonstrate against the horrible conditions in Moria and for opening all borders. ” to come together without caring about language, skin colour, nationality or religion. We want to come together to fight for human rights, freedom, equality and to fight also against the failing migration and refugee politics of Europe. Moria Camp: To lock everybody up on this island is not going to work anymore. Even now in Moria camp the situation is very bad, there is not even enough water for everybody. The people walked from the city center to the port and entered the port area. In front of a Frontex ship and the border police in the port their voices became even more powerful. This impressive and energetic protest against the EU-border politics was not the first in Mytilini and for sure will not be the last one! After the squat is before the squat: Welcome to Malaka beach! 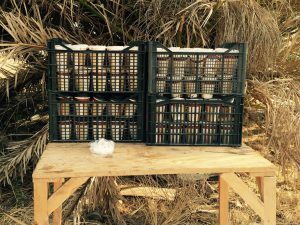 Tuesday this week a few friendly policemen encouraged us insistently take down our Social Center at the Beach near Mytilini. But no problem for us, a new Noborder Resort is on the way already! Chapter one: Chief P. gets serious. Tuesday this week we woke up to the sound of four police cars arriving at our Social Center: it was Chief of Police P. and his gang. Since a few weeks we were squatting a beach near Mytilini, after being evicted from the building just across the road. Until tuesday the harassment of the local police (the neighbours apparently don’t like us) had just been menaces, but now it was an ultimatum: go away or we will tear down your camp and arrest you within the next hour. To make the point clear, they destroyed a few of our „welcome pallets“ with a giant mechanical arm. The joke’s on them, we had already decided to remove that pallets as the beach was too dusty anyways for our taste. Since we didn’t want our stuff to get stolen by Papasouglu’s gang, we decided to unbuild the camp. Right now only desolation, a forgotten backpack and a couple of dirty pallet-beds stand where once was our lively social center. Chapter two: Welcome to Malaka Beach! The Social Center was gone, and the crew was demotivated. We’d been looking for other possible places for weeks, and noone seemed suitable. Then a rumor started to spread: a nice place, hidden, calm, with no unfriendly neighbors, and nearer to Moria than our old Social Center. Near the road to Moria around 40 minutes walk from downtown Mytilini you’ll find our new Noborder Resort. Activists without and with papers are working day and night to make it beautiful and provided with all the comforts. Putting tents and shady places, trying to find a toilet-solution and smoking cigarettes on what may be the most beautiful beach in the surroundings of Mytilini: a new social center is being built! We are there to stay and build something beautiful so stay tuned! Today, on Wednesday August 10th the chief of police came to our Social Center once again. He announced that he has orders to evict and arrest us tomorrow, if we do not leave voluntarily. We decided to stay where we are. The Social Center is a place for people to escape the harsh reality of Moria, where we can sit together, eat together and organize together. We will not give up this space easily. We will move if we have a better place to build our Social Centre. Until then we will resist together with the people using the Social Center to stay where we are. 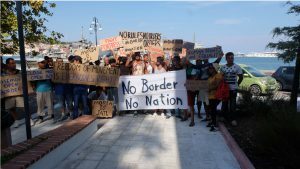 When the demonstration was at the port they faced the Frontex ship, showed them their banners and shouted „Open the borders!“. There were two banners at the front, one saying „Human rights for refugees“ and the other one „5 people in one tent? Where is the European Union?“. Also they were demanding „We need a solution“ and made clear that being inoprisoned in Moria is not a solution. In contrary, it is part of the problem. We need a real solution. We need the borders to be opened so everybody can freely move to a country of their choice. NoBorder Social Center remains in resistance! Yesterday, NoBorder Social Center was notified by the police to leave the place near Mytilene within several days. “We don’t need your help”, they said. In Moria, the situation is disastrous: there is insufficient provision of food, the place is overcrowded, basic necessities cannot be met. Moria is a jail! Yes, our activity indeed is needed! Under the current circumstances, there is no way we will stop our activities. Yesterday we had a spontaneous loud and powerful demonstration in the inner city of Mythilini. 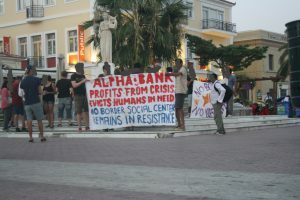 Refugees and other activists gathered together at Sapfous in front of the Lesvian statue to set a sign against Alpha Banks not existing social responsibility and also to the failures of Frontex and other European institutes. 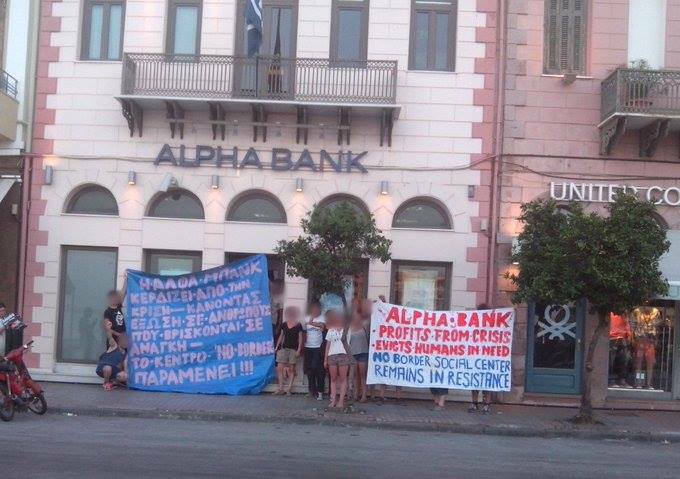 We walked along the harbour to the head quarter of Alpha Bank Lesvos, where we held a speech and banners. Then we walked through the inner city and held a speech again. We finished the demonstration at Sapfous. On our way we handed out flyers to inform the interested locals about our project and our wish to get the building back. No Border Social Center rests in resistance! Upon arrival in Lesvos, they are detained in Camp Moria for 25 days without adequate medical treatment and sufficient provision of food. 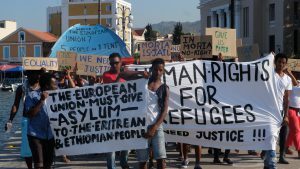 Those who fled oppression and misery are put into oppression and misery by the European and local authorities. In order to counteract this disastrous situation, NoBorder has opened a Social Center in an empty factory hall near Mytilene on the 22nd of July. 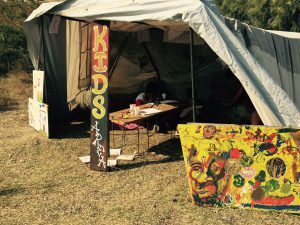 A safe space for refugees was created, which provided food, drinks, activities, clothing and child care in a self-determined manner, as an alternative to the depressed live in Moria. People of every nationality, sexuality, religions and genders were welcome. The empty, abandoned factory, in which the Social Center was realized, is property of Alpha Bank. 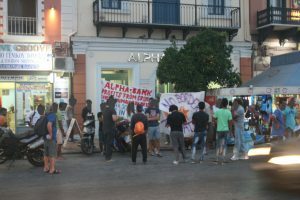 Without hesitation and without even considering finding an agreement, they enforced the eviction of the movement from the building on the 25nd of July. The humanitarian project had no place for them, although they did not have any other use of the building. Already during the economic crisis in Greece, they proved that it is profit, not humans, which count for them. Alpha Bank didn’t hesitate to evict people from homes and ruining local business. And they do not hesitate now evicting the NoBorder movement and the refugees from the empty factory. Only, they can’t evict a movement: We moved to the beach in front of the factory to build up the Social Center again, and we are determined to take our place back. 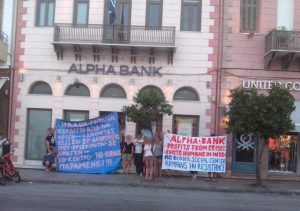 Let’s fight together against Alpha Bank’s policy of evictions, and for solidarity with the refugees! NoBorder Social Center rests in resistance!